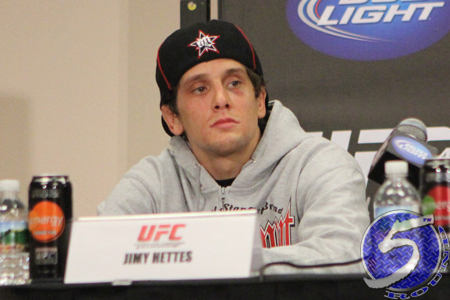 On Friday morning, a pivotal featherweight scrap between Jim Hettes (Pictured) Steven Siler was added to the “UFC on FX: Maynard vs. Guida” roster. Revel in Atlantic City, New Jersey is expected to host the June 22nd event. Hettes is perfect through his first 10 professional scraps, with his most recent W coming in a lopsided victory over Nam Phan at UFC 141. Outside of his December win, “The Kid” has concluded all of his fights via devastating finish. Siler owns an extensive 20-9 pro record and is unbeaten in his two big league bouts. “Super” was seen earlier this month serving up an upset special over bitter rival Cole Miller.